This suit of armor is just a few pieces shy of being full plate armor, possessing a breastplate, greaves, and vembraces of steel plate, all adorned with elegant brass edging. Knees, elbows, and feet are also protected with steel plate, while the upper waist and upper torso are adorned with a mail skirt and mail collar, respectively, to help enhance the armor's defensive strength. The armor includes a helmet, which has matching decorations of brass edging, while also featuring separate eye slits as well as cut-outs for easy breathing and ventilation. 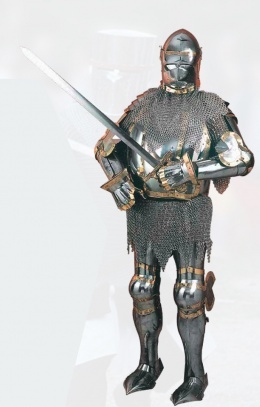 Please note that this is only a suit of armor and that it does not include a sword. Full plate armour developed in Europe during the Late Middle Ages, especially in the context of the Hundred Years' War, from the coat of plates worn over mail suits during the 13th century. This page was last modified on 28 October 2013, at 18:52.